1.Prepare Chicken Shawarma: In medium bowl, whisk garlic, yogurt, oil, lemon juice, salt, pepper, cumin, ginger, turmeric, allspice and cinnamon; add chicken, turning to coat. Cover and refrigerate at least 1 or up to 3 hours. 2.Prepare Hummus Bowls: Preheat oven to 425°. Spray rimmed baking pan with nonstick cooking spray. In medium bowl, toss carrots and oil; place on 1 side of prepared pan. Remove chicken from marinade; discard marinade. Place chicken on pan opposite carrots; roast carrots and chicken 25 minutes or until internal temperature of chicken reaches 165°. Transfer carrots to bowl; sprinkle with mint. Turn broiler to high; broil chicken 5 minutes or until crisp. Cut chicken into 1/4-inch-thick slices. 3.In small bowl, whisk yogurt and lemon zest. 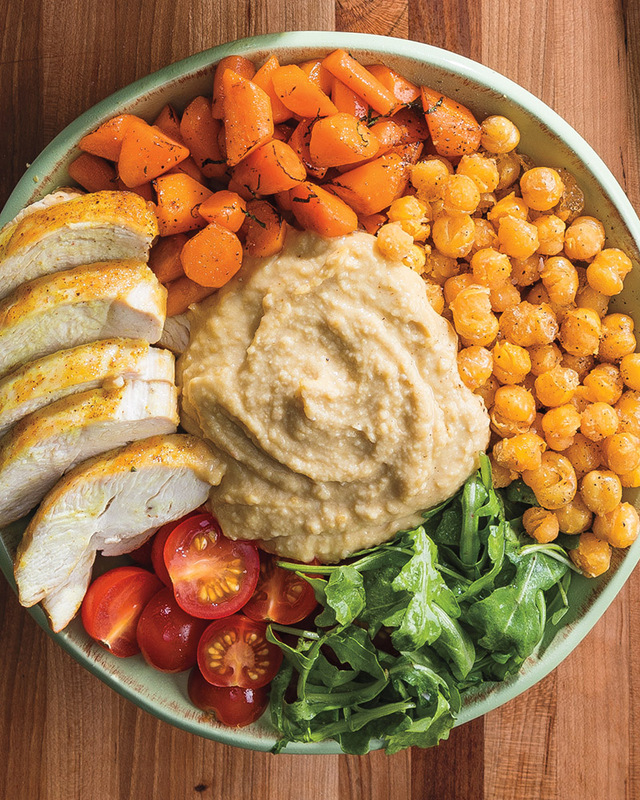 4.To serve, place 1/4 cup hummus in each of 4 bowls. Evenly divide tomatoes, arugula, chickpeas, carrots and chicken into bowls; drizzle with yogurt mixture. > Bowls are a great weeknight meal because they can be thrown together quickly and can be customized to each family member’s preferences.